Are you new to patina work? 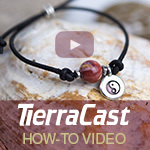 Then this how to is for you! 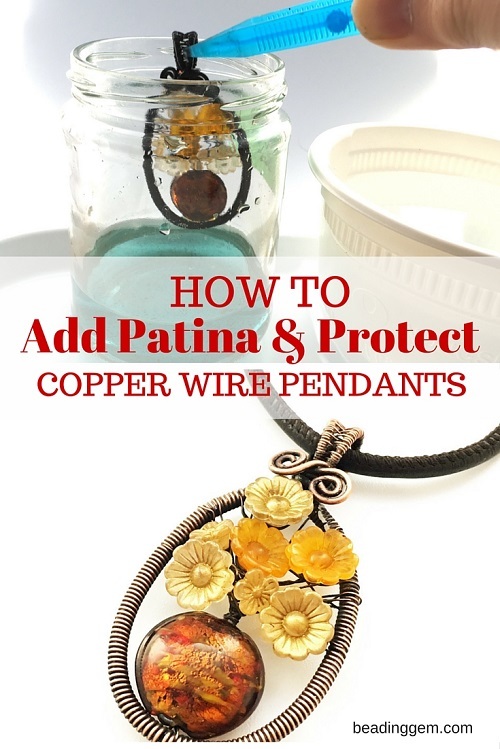 You can easily patina and protect any wire wrapped copper pendants with just a couple of key products. Antiquing copper is particularly gratifying because the results are gorgeous - the bits at the top contrast beautifully with the darkened metal in the low spots. 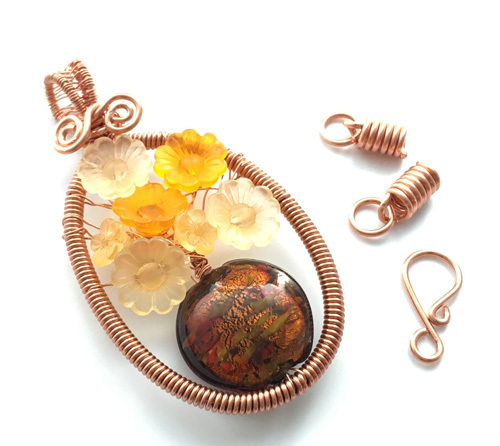 I made this vase and flowers pendant using uncoated copper (some were courtesy of Parawire), a gold foil lampwork bead and some Lucite flowers. 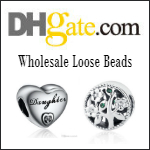 Be sure that the wire you use is not coated otherwise nothing will happen when you antique! 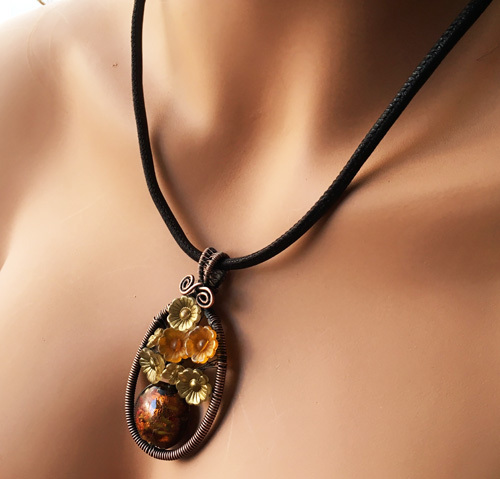 You can find a simplified tutorial for the pendant here. I added coiled wire for this variation. 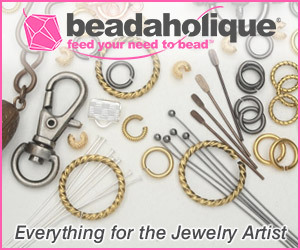 I also made wire coil ends, jump rings and a simple clasp. 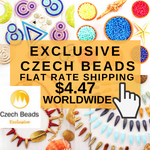 Please check my Wire Jewelry Tips for back posts on how to make some of the basics and many inspirational how tos. I like using Gun Blue to darken copper (Canadians can purchase this in the hunting section of Canadian Tire.) because it does not stink unlike liver of sulfur. 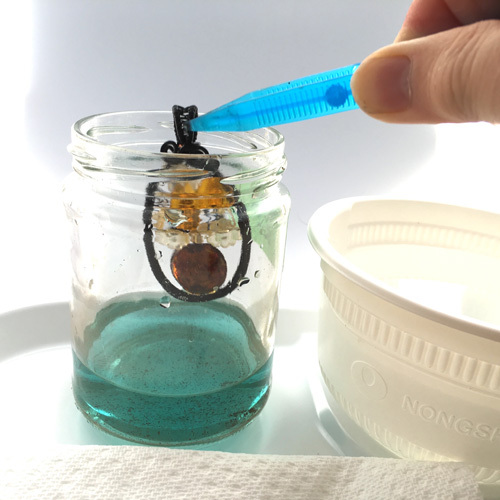 I did do the experiments to test out this kind of chemical solution for adding patina on different kinds of metals. It is very quick for copper - no heating is needed. 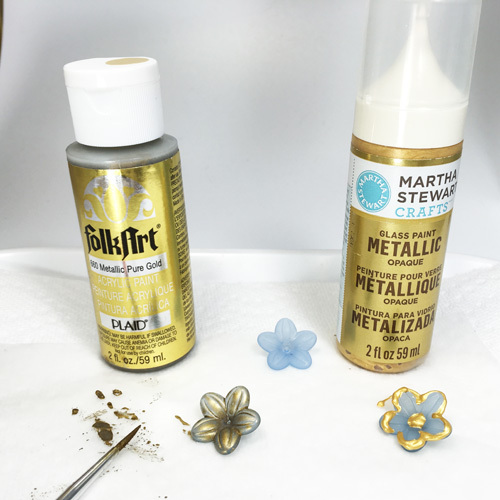 If you are antiquing silver, I suggest you use liver of sulfur gel. The regular stuff does not last long in storage. I keep my gun blue in a jar. 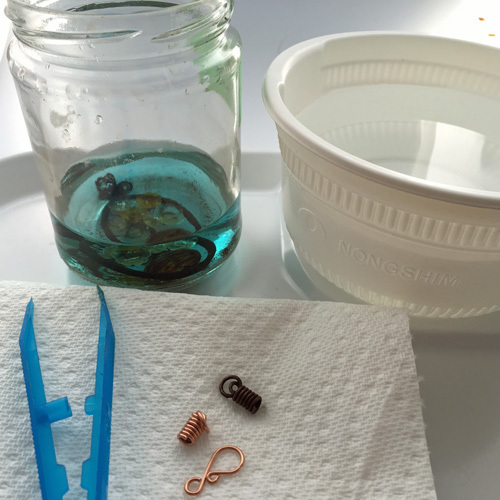 The pieces need only several seconds in the solution to turn the copper nearly black. Use plastic tweezers or make a simple wire hook out of coated metal to place and remove your pieces. Once you get that dark patina, take it out and rinse it in a bowl of water. Then dry the pieces with paper towels. 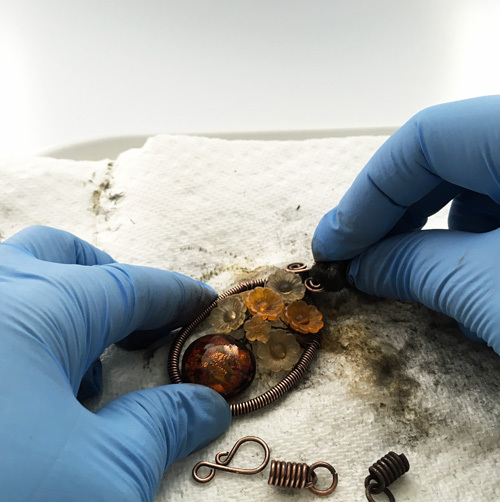 You can control how dark you want the patina to be by simply adjusting the time the pieces spend in the solution. As you can see below, the top wire coil end was not in the solution as long as the other ones. 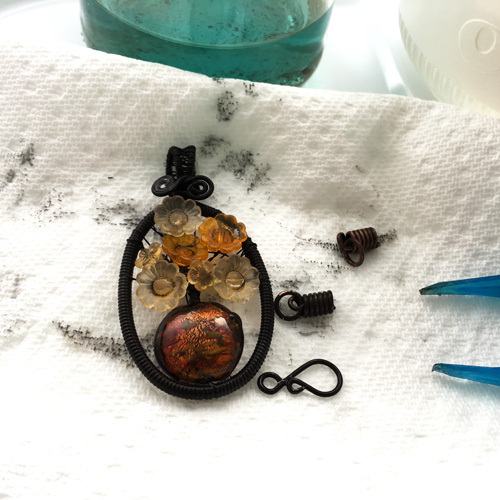 And yes, all sorts of sooty looking bits (oxidized copper) makes this a bit messy so protect your work surfaces! 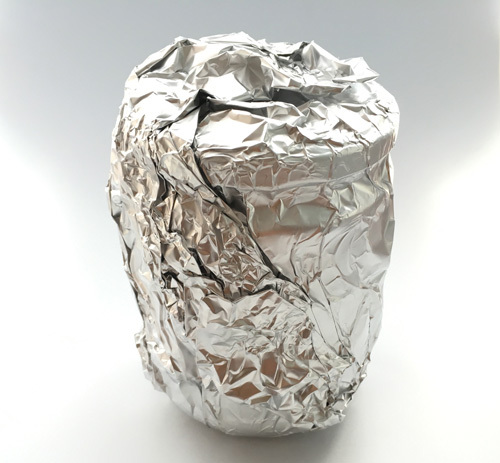 Close the lid of the Gun Blue jar and cover with some aluminum foil. This keeps the copper sulfate solution totally in the dark and will help it stay active longer. I store mine in a cupboard safely away from pets and small children. The next stage is really dirty work so wear gloves. It is not essential to wear nitrile gloves for this step - any rubber or vinyl gloves will do. I used a small wad of #0000 steel wool to rub off much of the patina from the high spots. As the steel wool cannot reach the low spots, these areas will be darker. You can also use a small sanding pad or wet/dry sandpaper. Nitrile gloves are better than rubber gloves or vinyl ones as they are more resistant to chemicals which is why I use them for this polishing step. I applied a small amount of Renaissance Wax Polish all over the pieces and then buffed off the excess with paper towel. 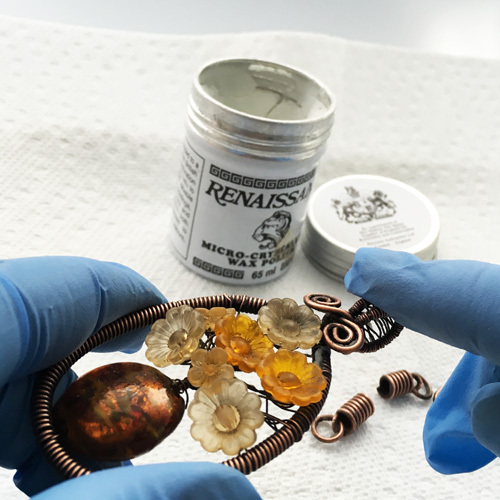 You can read more about what Renaissance wax is and how safe it is to use for jewelry making in this past post. To my horror, that dunk in Gun Glue really dulled the pale Lucite flowers, making them very insipid looking. So I tried a couple of paints I had on some other Lucite flowers. My hand is none too steady for adding dimensional glass paint! But I liked the effect of metallic acrylic paint and that is what I did to touch up those Lucite flowers. After the paint dried, I attached the cord ends and clasp and strung on the pendant to some dark brown stitched leather cord, courtesy of Endless Leather. Final design photographs taken in natural light with my iPhone 5, camera+ app and Modahaus TS300 photo studio. The studio photos were taken with artificial LED lights and my TS400 photo studio. 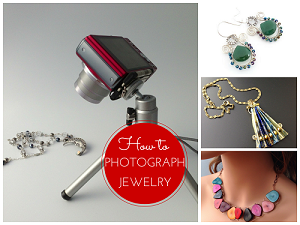 Click here to find out more about my How to Photography Jewelry webinars. Your pendant is STUNNING, Pearl! I have lots of those lucite flowers and want to try metal points on them now. The patina looks awesome! 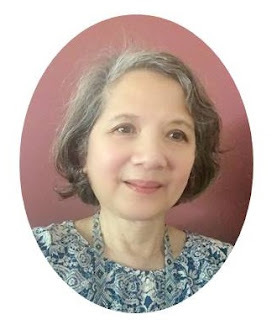 Thanks so much for your kind words! 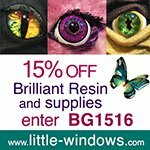 Look forward to seeing what you do with your Lucite flowers! Oh what a shame about the lucite flowers! However you did do a great job painting them. I had to go back and see the original to see the difference. Unfortunately there's probably no way around that is there. I think the next time I'm in Canadian Tire I might get some gun blue. 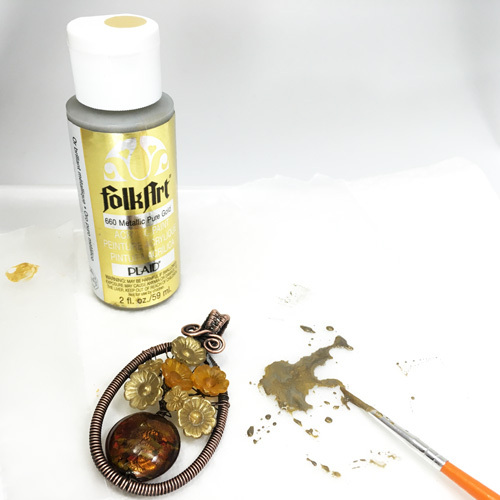 I do have my stash of Liver of Sulphur in chunks and gel form - but it's always fun to try a different approach. Well things happen! The rescue taught me something- it is worth adding paint to Lucite flowers!! I like how the experimental blue flower turned out. LOS in chunks has a short shelf life. So you might like using that up first. Thanks! Have fun making some!